Home Modern Mysteries Ghost Ship – What Happened to the Crew of the Casie Nicole? Ghost Ship – What Happened to the Crew of the Casie Nicole? Over twenty years ago, on April 10,1990, four men left on a commercial fishing expedition out of Georgia. Five days later, one of those men was found clinging to life in a makeshift boat made out of a baitbox. The three other crew members have never been found. 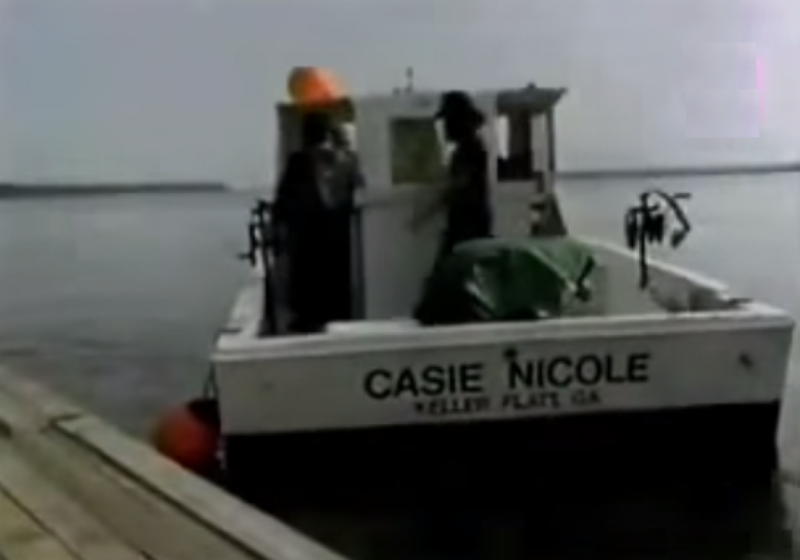 This is the story of the Casie Nicole, a boat captained by Billie Joe Neesmith. The other crew consisted of Billie Joe’s brother, Nathan, their nephew, Keith Wilke, and a friend, Franklin Brantley. On the second day of the trip, Nathan discovered the boat was not running right, and he woke up his brother to alert him. Further investigation showed that not only was there a mechanical issue with the craft, but it was taking on a lot of water. All the men attempted to bail out the boat’s cabin by hand, but the effort was in vain. The bilge pumps were not operational for some unknown reason. At one point, the boat lost all power. The decision was then made to abandon ship. Billie Jo directed the other three to get into the life raft. According to Nathan, the life raft was in poor condition and had a hole in it. The men stayed on the raft until they found a large floating piece of debris from the Casie Nicole that they took refuge on. Nathan then noticed the hull of the Casie Nicole about three miles away. Against the protests of the other three and pleas to stay together, Nathan swam out to the hull, a feat which took him almost a full day to complete. The next morning, he noticed a freighter in the area where he thought his brother and the other two men would have been located. The freighter acted oddly, traveling in circles and appeared to stop several times. This gave Nathan the impression they were picking something up out of the water. Nathan was found barely clinging to life three days later. Though the Coast Guard launched an intensive search for them, no sign of the others was ever found. Theories about what happened to the missing men are varied. Some say Nathan’s story is suspicious. The claims he swam for over seven hours to reach the hull, abandoned the others, and the freighter appearance are far-fetched. They feel he was either directly involved or the four of them were part of a drug trafficking ring, and something went awry. Others, interested in the story, think the freighter was involved in the drug trafficking and that crew took the men prisoner or killed them to keep them quiet. The family holds with the idea that the men were taken prisoner by the crew on the freighter and have been held in a foreign country, possibly Cuba. The fuel for these thoughts is a series of bizarre phone calls that the Neesmith’s sister, Oneida, and the Casie Nicole’s owner, Doug Tyson, received in the year following the disappearances. There was a total of 5 calls made to the two of them. The initial calls involved a man, who appeared to only speak Spanish, stating the name and number of the person he was calling. The last call was from a man with a heavy accent who said he was “bringing him home”. The family and Doug believe that this man was referring to one or more of the missing men. They hold out hope that they are alive somewhere though no evidence has been found to support that theory. The government has declared the men missing at sea and presumed dead. The public may never find out the true fate of these men and it will remain a secret of the Atlantic, an enigma that will forever have us speculating as to the fate of the crew members of the Casie Nicole.